Heat a comal or dry skillet over low-medium heat until hot. Remove the stems, seeds and veins from the ancho chiles. Toast over the hot comal or dry skillet, over medium heat, for about 15 seconds per side, until chiles have softened and then begin to toast, have changed their color and released their aroma. Be careful not to burn them. Place the chiles in a saucepan and cover them with water. Bring to a boil and simmer over medium heat for 10 minutes, until they rehydrate and look plump; let cool. Place chiles and 1/2 cup of their cooking liquid in a blender along with the orange juice, lime juice, white onion and salt. Purée until smooth. 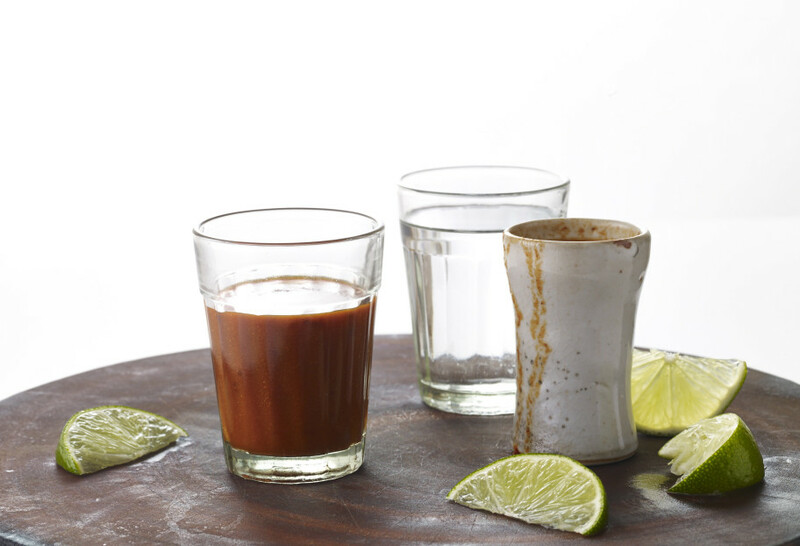 Serve as a drink alongside tequila in caballitos or straight, poured over ice cubes. Sangrita can be refrigerated for up to a week.